London Gazette entry 2 October 1942. Royal Regiment of Artillery & No. 4 Commando. At Dieppe on the 19th August 1942, T/Captain Porteous was detailed to act as Liaison Officer between the two detachments whose task was to assault the heavy coast defence guns. In the initial assault T/Captain Porteous, working with the smaller of the two detachments, was shot at close range through the hand, the bullet passing through his palm and entering his upper arm. Undaunted, T/Captain Porteous closed with his assailant, succeeded in disarming him and killed him with his own bayonet thereby saving the life of a British Sergeant on whom the German had turned his aim. In the meantime the larger detachment was held up, and the officer leading this detachment was killed and the Troop Sergeant- Major fell seriously wounded. Almost immediately afterwards the only other officer of the detachment was also killed. 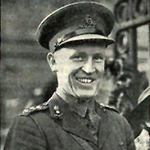 T/Captain Porteous, without hesitation and in the face of a withering fire, dashed across the open ground to take over the command of this detachment. T/Captain Porteous's most gallant conduct, his brilliant leadership and tenacious devotion to a duty which was supplementary to the role originally assigned to him, was an inspiration to the whole detachment." The rank shown on the LG entry was originally Major, however there was a correction in a later LG issue. War Office, 6th October, 1942. ERRATA. The rank of Lieutenant (temporary Captain) Patrick Anthony Porteous (73033), Royal Regiment of Artillery, is as now shown and not as on page 4323 of the London Gazette dated 2nd October, 1942.